The movie industry finished a monster year with the biggest film-going weekend in recent history. I knew without reading another sentence that there would be no inflation-adjusted data or population-adjusted data or much in the way of holiday-weekend acknowledgement. Rather than simply grit my teeth in passive frustration, I dove into active frustration: find data sources alluded to in the syndicated story. There are two factors that unadjusted movie sales data ignore: the year-to-year increase in ticket prices (inflation) and the year-to-year increase in the movie-going-age public (audience). What passes for Hollywood reporting almost always (I use that sweeping generalization mindfully) ignores these two factors; instead, reporters simply transcribe data given to them by Hollywood.com. That beat the previous record of $261 million for a three-day take — set in July 2008 when “The Dark Knight” debuted — even when accounting for ticket price inflation, according to data from Hollywood.com. The Los Angeles-based firm’s data go back to about 1985. And, of course, the LA Times won’t give inflation adjusted #’s or tickets sold per population, because it works against a major advertising group. Nor will they tell you the ‘weekend’ now starts Wednesday AM, not Friday at 5pm as before. There is only one data source, so the reporter should provide readers with not only this fact but also the limits of the data. Hollywood.com does not provide details on its pdf-data sheets; I thought F-S-S data went from 12.00 am Friday through 11.59 pm Sunday. Hmmm. 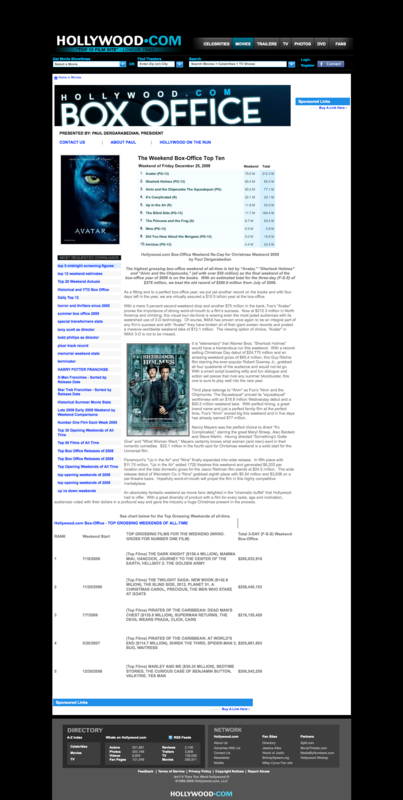 If the reader is wrong and the three-day sales data truly represent the same time period, then this 2009 box-office “beats” the July 2008 one by 2.5% based on inflation-adjusted sales. I adjusted 2008 sales based on an estimated 4% increase in ticket prices (pdf and Hollywood.com/boxoffice png, as this page content is ephemeral). 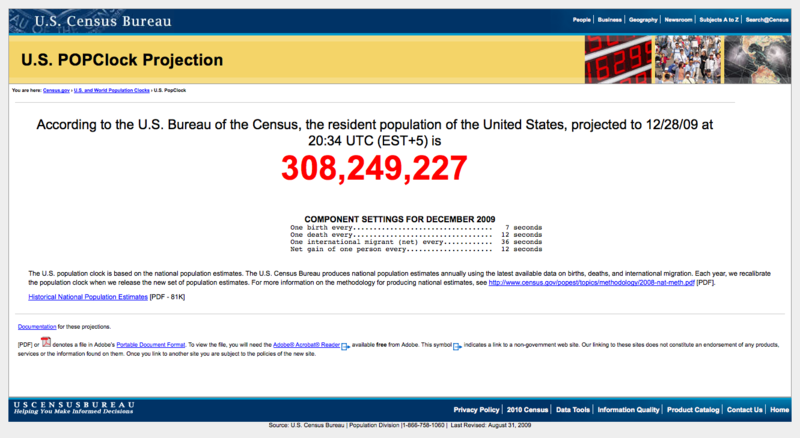 According to the US Census, today’s population is estimated at 308,249,222 (png). July 2008, the estimate was 304,374,846 (excel). The 18-month growth estimate is 1.3%; these data are limited because they don’t measure the growth in the population that pays child and adult ticket prices. Thus, assuming that the July 2008 three-day time period matches the December 2009 one, there was a very slight increase in box office sales, after accounting for population growth and ticket inflation. Q: When was the last time Christmas was on a Friday? A: 1998, and there seem to have been no major releases. There is no accounting for the holiday weekend demand or why movie studios failed to use the Christmas 1998 weekend as a successful launch (total opening gross for four movies in 2009 dollars, $88.44 million). Two things are more interesting to me than hyperbolic reporting. This appears to be the first weekend ever, according to several studio executives, that three separate movies each grossed more than $50 million domestically. Concurrent with the splitting of the audience is the lack of a clear “blockbuster” like Dark Knight, which grossed $158 million its opening weekend (4,366 theatres, 18-19-20 July 2008). Avatar, on the other hand, grossed only $77 million when it opened (3,456 theatres, 18-19-20 December 2009). But why did Dark Knight out-sell Avatar its opening weekend? Might it be in part because it was in more theatres (4,366 theatres versus 3,446)? And might Avatar’s sales be inflated by the ~30% premium for 3-D tickets? Questions, questions, questions. Nevertheless, this year’s top three holiday weekend winners had a combined gross of almost $200 million: Avatar, $75 million (week 2); Sherlock Holmes, $65.4 million (3,626 theaters, week 1); Alvin and the Chipmunks, The Sequel, $50.2 million (3,700 theatres, week 1). However, the top three movies from July 2008 exceeded $200 million gross (2008 dollars). Thus, the 2009 weekend “win” rests on audience diversification (another way to say “fragmentation”). The second interesting tidbit is that we seem to love science fiction movies (broadly defined). Maybe the audience is skewed by teenage males, or maybe it’s simply escapism in the ’00s. But of the top 30 opening weekend winners (unadjusted dollars, pdf) from 2000-2009, 22 are science-fiction-related. Seven of the 22 are classic science fiction (space travel, technological dystopia); seven are fantasy (dragons, werewolves); eight have roots in comic books (Batman, Iron Man, Spiderman, X-Men). Yes, these movies lend themselves to spectacular special effects that pale in an in-home viewing experience, but is that enough to make them dominate sales? The remaining eight? Johnny Depp (2, Pirates); Harrison Ford (1, Indiana Jones); Mel Gibson (1, Passion); Tom Hanks (1, Da Vinci Code); and animations (Shrek, 2, and The Simpsons, 1). I think an argument can be made for escapism, whether we were trying to forget 9-11 or the poor economy. According to Hollywood.com (pdf), from 1990-2009 ticket sales (tickets, not dollars) peaked in 2002 at 1.6 billion. Despite the “blockbuster” implications of that lede that inspired this journey, ticket sales for 2009 will be off 13% (estimate) from that peak and only slightly above sales in 1997.